The Taylor & Francis Group cannot sell Federation Press products in your shipping region. For more information, please visit the Federation Press website. 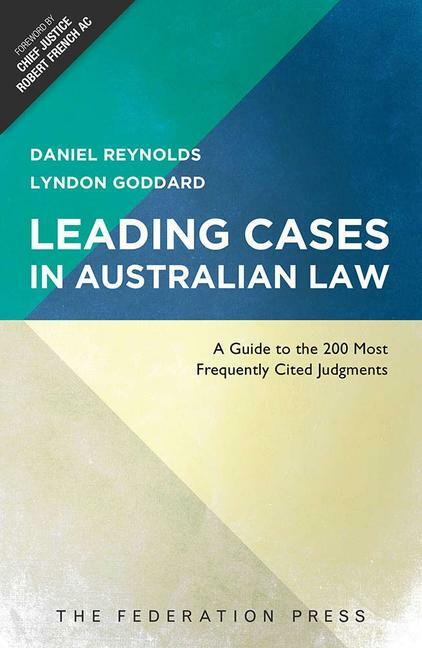 Leading Cases in Australian Law provides, in essence, a summary of the 200 most cited cases in Australian law. Each case note contains an outline of the facts, issues and decision, an extract of the most frequently cited portions of the judgment, commentary incorporating later decisions on the topic, and cross-references to the leading texts on the legal area of the case. Finally, under each case heading there is a single-sentence proposition for which the case stands as authority, and these are later collated in a table for easy reference. This is the first book of its kind published in Australia, and it is intended to serve as a portrait of Australian law as currently practised. Appendices are included to complete this picture, providing further information such as lists of top cases by subject area, and a ranking of the most cited judges. This book will be useful to law students, who will likely encounter most of these cases during the course of their degree, as well as to legal practitioners, who will find it a useful reference for the cases that have faded from memory since law school as well as the cases cited in daily practice. Simon is a Professor of Law at the Australian National University, where he is Director of Law Reform and Social Justice. He researches and writes in discrimination, human rights, access to justice and public interest lawyering. From 1996-2011 he was a part-time judicial member of the NSW Administrative Decisions Tribunal in the Equal Opportunity Division. He is a past President of Australian Lawyers for Human Rights, and a former Director of the NSW Law Foundation. Professor Andrew Day is a clinical and forensic psychologist who has worked in correctional and forensic mental health services in the UK and Australia. He is a Professor in the School of Psychology, and an Associate Director of the Centre for Mental Health and Wellbeing at Deakin University. Dr Day obtained his Doctorate in Clinical Psychology at the University of Birmingham UK in 1994 and Masters in Science in Applied Criminological Psychology at the University of London UK in 1991 that included work as a Prison Psychologist with the UK Home Office. He has published many research articles on offender rehabilitation, co-edited textbooks for pre-university Psychology curriculums, and presented conference papers at national and international research conferences. His current research interests focus mainly on the development of therapeutic and rehabilitative approaches for offenders.